When discussing future career options physical therapy and sports medicine are frequently misunderstood as the same thing. While they are similar disciplines in that they both focus on healing injuries, there are distinct differences. Both have become popular choices and rightly so. A number of professionals might describe Physical Therapy and Sports Therapy as two of the most exciting and fulfilling career opportunities in the medical field. While these career paths may seem similar, there are differences. Below is an outline of each career and what makes them distinct. When learning about physical therapy (PT) as a profession, there is one physical therapy definition that you will likely find helpful when exploring PT as a career. According to the American Physical Therapy Association (APTA), physical therapists are “highly-educated, licensed health care professionals who can help patients reduce pain and improve or restore mobility.” Physical therapists work with all kinds of patients, whether they have been referred for rehabilitation after injury and subsequent surgery or are trying to improve range of motion for daily activities. A physical therapy salary can be lucrative for those who have both education and experience. Physical therapists in the United States can make substantial average annual salary. This fact, in addition to the knowledge that jobs in this field are expected to increase by 28% between 2016 and 2026, according to the Bureau of Labor Statistics, make physical therapy a promising line of work for years to come. Sports therapists are defined by the Society of Sports Therapists as “Sports Therapy is an aspect of healthcare that is specifically concerned with the prevention of injury and the rehabilitation of the patient back to optimum levels of functional, occupational and sports specific fitness, regardless of age and ability.” Sports therapists may work specifically with athletes, and are usually used by sports teams nationwide in designing plans for optimizing workouts and preventing injury, as well as addressing and healing injury after it occurs. For those looking for a career working with athletes, Sports therapy is also an excellent choice of profession. Both sports therapy and physical therapy might handle a number of similar tasks, but there are notable differences between the two careers. One of the most significant distinctions between these jobs might be the client base. 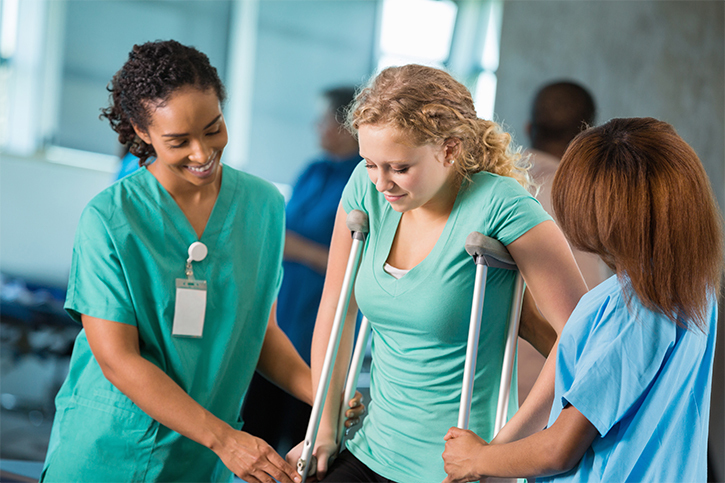 Physical therapists work with any and all patients who are in need of rehabilitation or mobility expansion. Their clients might be referred by the patient’s main doctor, and their role is to be a secondary source of recovery from surgery or disability. Sports therapists, on the other hand, work specifically with athletes, and are often times may be hired by sports teams to help prevent injury and the rehabilitation of patients back to optimum levels during competitions. Because of the difference between a physical therapists and sports therapists, the place of occupation might also differ. While both professionals can own private practices and work in offices, it might be more common for physical therapists to work in this environment while sports therapists may need to travel for their work and are likely actively involved with teams in practices and competitions.